Though today's artists have a world of technology at their fingertips, many still choose to work in a more traditional manner. These are not painters who create works using oil, acrylic or watercolor – they're artists who take everyday objects like matches, buttons and nails to make intricate artworks that deserve a closer look. This post is republished from My Modern Met in partnership with Federated Media and smartwater. Using thousands of separate pieces, these artists create highly detailed sculptures and installations that require a great deal of skill and an unbelievable amount of patience. While examining their works, not only do we get to appreciate how ordinary objects have been turned into something extraordinary, we get to stand back in awe and appreciate the creativity and ingenuity that lives inside us all. Today, we're proud to present seven artists who, in their own unique way, have inspired us with a commitment to their craft. These are the artists who have both the confidence and foresight to recognize that by spending weeks (or even months!) meticulously arranging thousands of pieces, they can create a magnificent artwork that we all won't soon forget. From the London-based artist who suspends flowers from ceilings to an Orange County, California-based artist who drills screws to create three-dimensional portraits, these are the ones who push creative boundaries (and, in doing so, inspire a legion of fans to follow in their footsteps). Artist Rebecca Louise Law immerses viewers in her beautifully surreal upside down gardens. In one day, Law typically works with a team of 10 to 40 people to create these whimsical installations that make you feel as though you've stepped into Wonderland. Her greatest challenge is the ephemeral nature of flowers: At the start of each installation, she keeps in mind how she is going to persevere the flowers so that they last longer than one week. As she explains, "Timing at the first stage of the installation is crucial, as I like the whole installation to dry at the same rate." Last year, Law was commissioned by London's Garden Museum to create the site-specific installation Roses. Over 3,000 multicolored roses were hung on copper wire and ethereally suspended from the museum's main building. Until July 18th, you can see her latest work, alongside those by artists Damien Hirst, Beth Carter, Kathy Dalwood and Patrick Haines, in the exhibition Odyssey at The Church of St Edmund the King in London. While many of us haven't picked up crayons since we were kids, artist Christian Faur sees them as a natural part of his everyday life. The artist doesn't buy crayons off of store shelves – he makes them by hand using a special mixture of beeswax, crystals and pigments. Then he carefully arranges them like pixels until they form a photorealistic portrait of a person. "A typical square icon on the iPhone has 60 x 60 pixels with millions of possible colors," he says. "Many of my compositions completely fail at this resolution, and never get made." To help with this limitation, Faur relies on portraiture. "Believe it or not, the human face requires the least amount of resolution, as we're 'hard-wired' to see faces: Our brains fill in the gap when the resolution is missing. If I were to try and create a cactus, cup or carrot at the same resolution, the photographic nature of the work would not be perceived." This "filling in" gives the work a magical quality when viewed in a gallery. "As you slowly approach the work, the image gets more difficult to perceive. Then, when the brain sees the crayons as individual objects, the overall image is lost. I love watching people move closer and farther from the work, trying to understand where the real image resides." If you can't see Faur's works in person, he has an eBook called A Box of Crayons which allows users to look at a complete crayon work and then swipe to see its many detailed shots. (The artist wanted to mimic a gallery experience by providing people with multiple views of the same piece.) Alternately, you can wait for Faur's next show, a solo exhibition at New York's Kim Foster Gallery sometime in 2015. For up to three weeks straight, UK-based artist David Foster transforms an all white canvas into an incredible portrait by hammering in thousands of nails. Many of his pieces are portraits of instantly recognizable people including Nelson Mandela, Marilyn Monroe and Bob Dylan. Originally an architect, Foster draws on his technical drawing background to carefully plan and construct his artwork. Like many artists featured here, there is no room for mistakes. As he explains, "On a white background, one nail in the wrong place can ruin a picture and waste weeks of work. I can't paint over the hole or fill it in because those corrections would be noticeable." 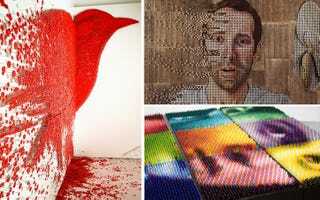 Foster's pointillist images take on average 5,000 nails, but that number can go as high as 30,000. His technique has evolved over time, and the artist now prefers tiny nails so that the viewer can interpret the work more closely and in greater detail. In his studio, he has over a half a million of these nails, waiting for their new "home." The artist recently exhibited at The Liverpool Contemporary Art Fair and has many of his works in galleries across the United Kingdom. Artist Michael Mapes has created an intriguing series inspired by the beautiful 17th century paintings of Dutch masters like Rembrandt, Vermeet and Nicolaes Eliasz Pickenoy. On top of a white foam board like those used by entomologists to pin insect specimens, Mapes assembles miniature objects including photographic prints, gelatin capsules, glass vials and beads until they form one cohesive portrait. The work seen here, Dutch Specimen MT1639, is composed of over 5,000 pieces. "They're fairly tedious to create," he says, "so I try to bring a painter-like approach to working on them. Making changes that involve so many individual elements can be challenging, if not punishing, but my interest lies in discovering the composition of the work while making it." Mapes has many upcoming exhibitions this year. In London, he'll show five works alongside two other artists as a part of Beers Contemporary's show Cut-Copy-Paste from August 1st to September 27th. In the Hague, he'll be a part of the show Revisiting the Golden Age at Pulchri Studio from August 9th to August 31th. Excitingly, Dutch Specimen MT1639, the very first work in Mapes's Dutch series, will be exhibited for the next two years at the residence of the US Ambassador to The Netherlands in The Hague as part of the Art in Embassies program. Chicago-based artist Pei-San Ng takes thousands of antique matches and assembles them into everything from beautiful typography to an image of a phoenix. From concept to completion, her works take about two months to complete – with a large portion of that time devoted to developing the idea – and all carry a deep meaning. "I want the concept to be intertwined with the material, since the image or text has to revolve around fire in one way or another," she says. "Not only must I break down an image or word into evenly spaced dots, but I must also decide what colors to use. Then, assembly begins. This, in some ways, is the simplest part, because I believe in the idea enough to spend hours and hours of glueing." Depending on the size of the piece, assembly can require days or even weeks of tedious repetition, all building up to the most fun part for the artist: burning. In between, she adds, "I rely heavily on hot tea, back rubs and lots of Chinese television dramas." Ng is currently experimenting with displaying her work at less traditional gallery spaces like fire stations. She's also interested in creating more site-specific work. Myers says that his greatest challenge is the labor. "It can be physically draining to install screw after screw for hours on end," he says. "These piece take anywhere from two to six months, depending on the size and subject matter." A blend of both a sculpture and painting, these are unique works one can only fully appreciate in person. The artist will be showcasing his latest piece at The Festival of Arts in Laguna Beach from July 5th to August 30th. Korean-born and Brooklyn-based artist Ran Hwang creates astonishing murals using tiny materials typically associated with clothing – buttons, beads and pins. Extremely time consuming and very repetitive, each piece takes an incredible amount of work. Hwang recalls that when she first was starting, she'd only be given three to seven days to complete an installation, so she'd be hammering pins and buttons directly on gallery walls all night long. Now, her large-scale pieces, which average more than 30 feet wide, take her about a year to complete, whereas smaller works take around three months. For the piece above, Dreaming of Joy, Hwang leveraged close to 60,000 red buttons and pins to create a gigantic 16-foot high bird. In her typical style, Hwang left a scattering of pins on the floor, beneath the silhouette of the image. Though at first glance the work may seem unfinished, Hwang deliberately left a pile of buttons on the floor. The artist shuns use of any glue, so that buttons stay or fall on their own accord. Until August 31st, you can see Ran Hwang's work in a solo exhibition at AAW Gallery in Beijing, China. Next March, she'll also be showing her work at New York's Armory Show, where she'll be represented by Leila Heller Gallery.